How to draw a boy? 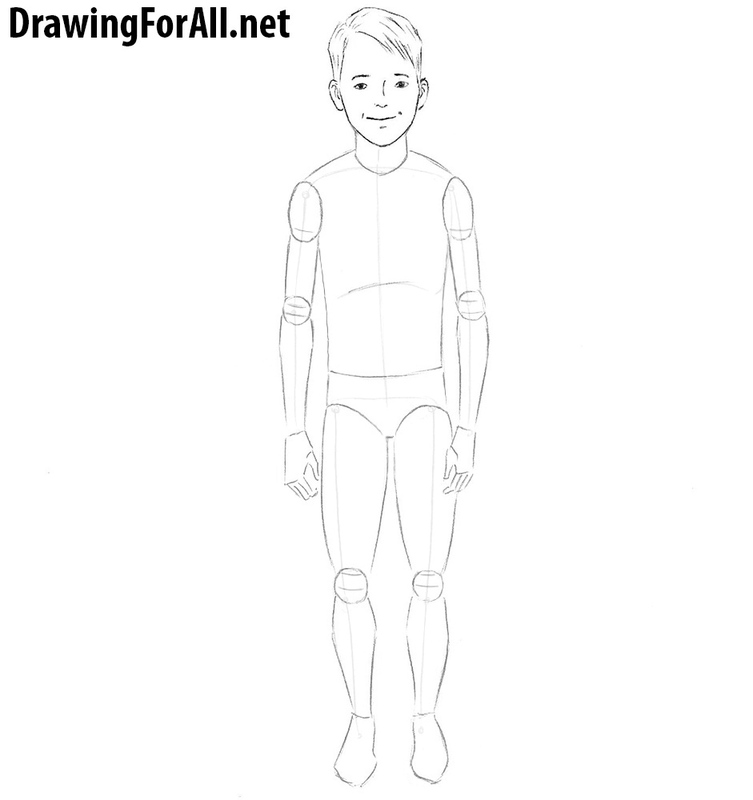 In this drawing tutorial we will show you how. But before we start a lesson, we would like to mention a few important points. 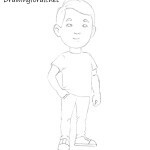 The basic principles of drawing will be virtually the same as in adult figure, but the proportions will be slightly different. To draw a boy we need to draw his skeleton. It is a base of future drawing. We always start from a head, this lesson will not be exception. Sketch out the head in a shape of an oval. Then sketch out the neck that goes to the spine. Next sketch out the chest and pelvis. Sketch out the arms and legs using simple lines. Mark up the joints using small circles. Note, that the heads of kids look proportionally bigger than the heads of adult people. 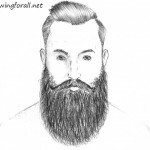 Draw a vertical line that should go right through the center of the face. Then sketch out a horizontal line (line of the eyes) that that should cross the vertical line right in the center of the face. Sketch out the lines of hair, nose and mouth. 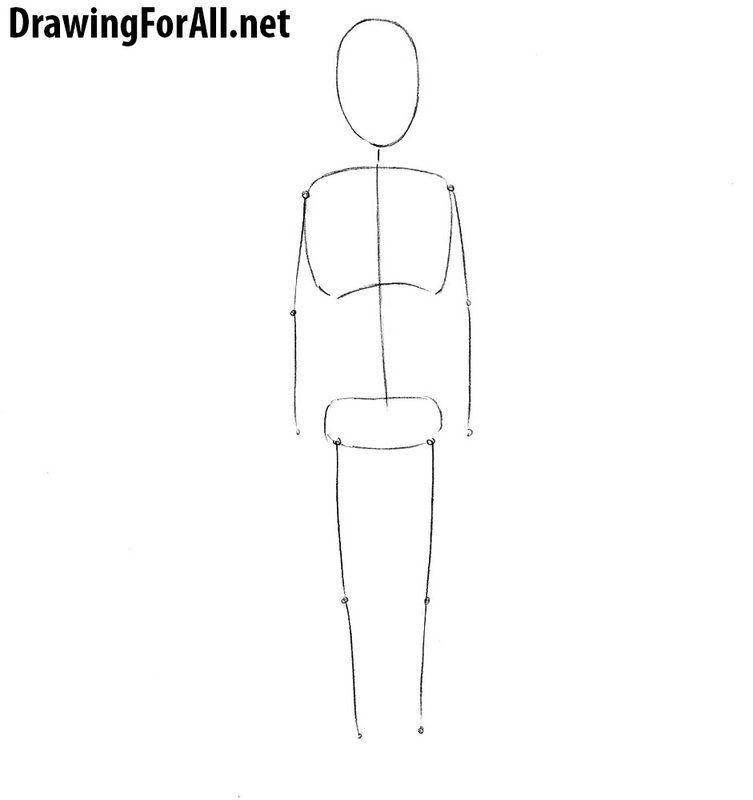 Sketch out the parts of the body using simple geometric shapes – cylinders as guides for the neck, arms and legs, circles as guides for the shoulders, elbows and knees. Here we start adding details to the face of the boy. Right on the horizontal line draw the eyes. Above the eyes draw the brows, and then draw the nose and mouth using the short lines from the previous step. Continue adding details to the head. 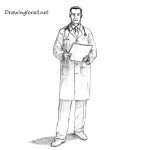 Draw the hair. First draw the main outline of the hair and the sketch out the lines of hair inside the shape. At the sides of the head draw the ears, the upper edges of which on one level with the brows and lower edges on the same level with the tip of the nose. And at the end of the step draw out the outlines of the jaw. And we continue the lesson on how to draw a boy. 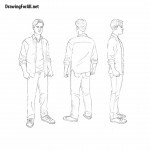 Draw out the outlines of the shirt. Add some folds as in our example. Erase the guidelines from the neck and torso. 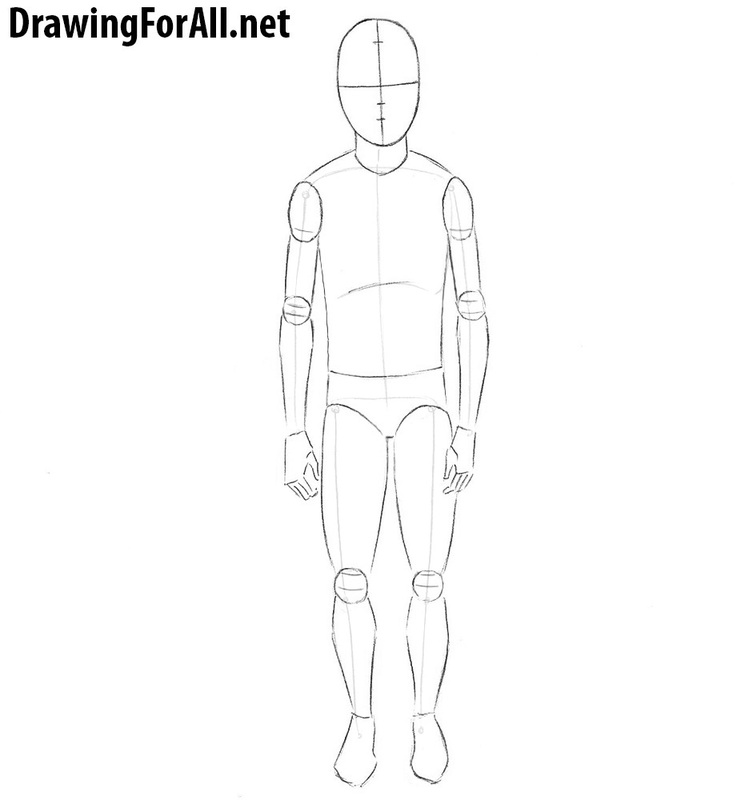 Draw out the arms. 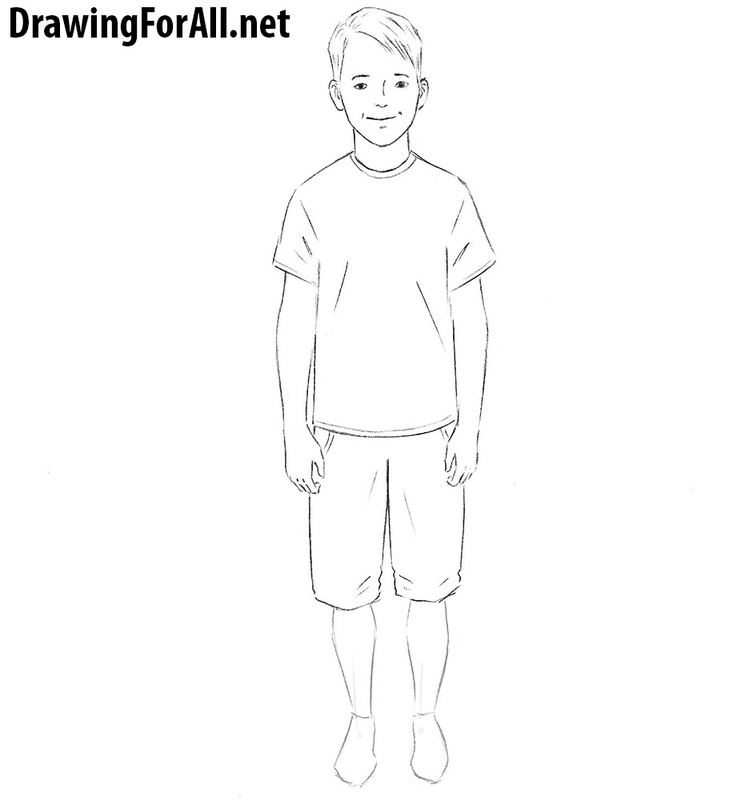 Note that the figure of children and their arms in particular have no clearly visible muscles. Draw out the hands. 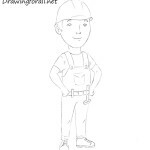 If you want to learn more visit the lesson on how to draw hands. Continue drawing a boy. Draw out the shorts. Add some folds and pockets. 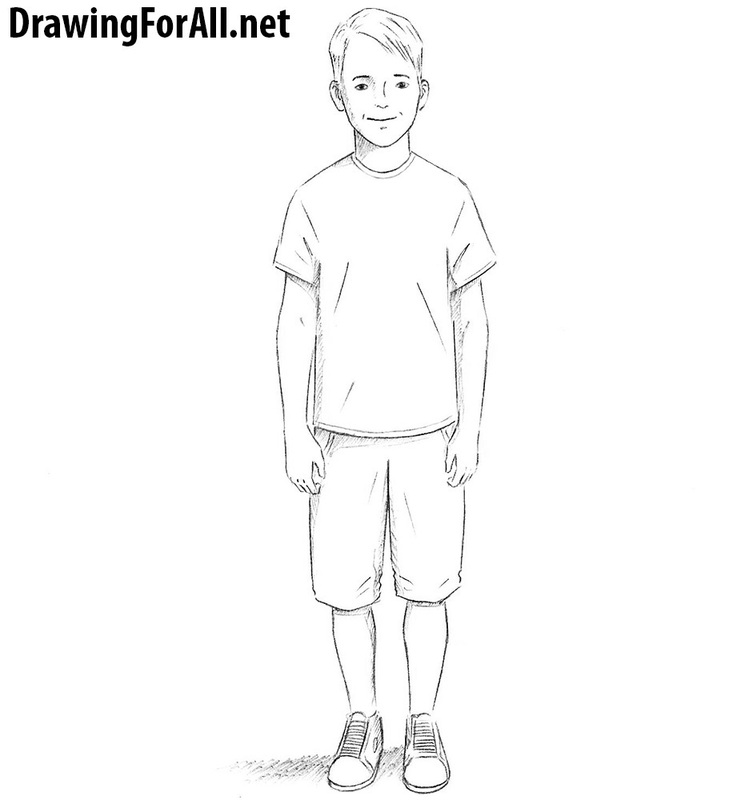 For example we draw a boy in t-shirt and and shorts but you of course can draw him in any other clothing. Draw out the shins of our today’s character. The upper part of the legs in this tutorial covered under the shorts. Draw out the shoes. In general the drawing lesson on how to draw a boy is over, there is only one step. Let’s add some shadows. First we determine the source of the light – in our example the light comes from the upper right corner. And then add shadows using simple hatching. We hope that we were able to explain how to draw a boy as much detail as possible. 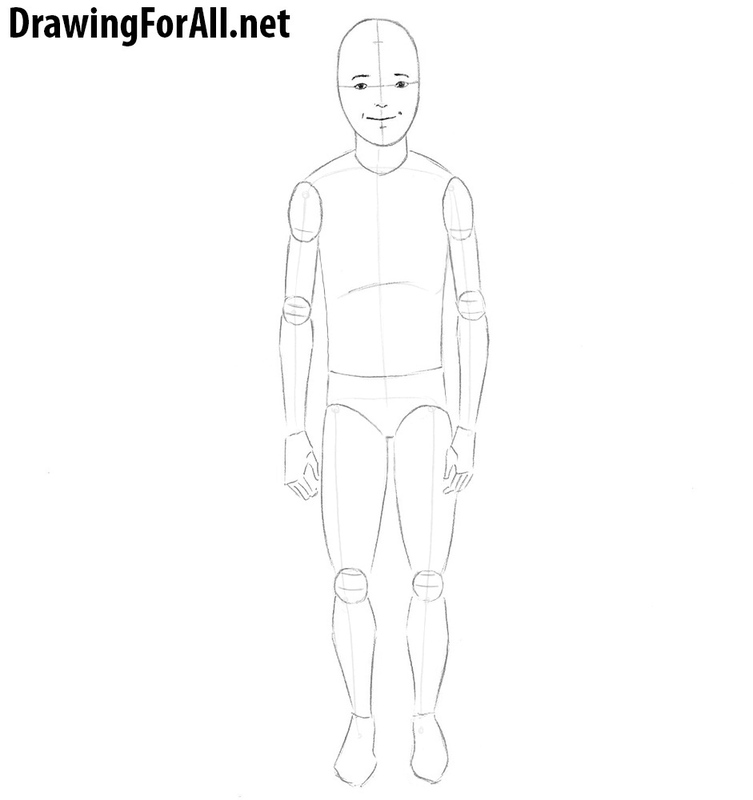 If you have any comments and requests feel free to write it in the comments below this drawing lesson.